Middlebury ~ Eleanor Jones Harvey, senior curator at the Smithsonian American Art Museum, will discuss the paintings of Frederic Church in the context of American ambitions in a talk at Ilsley Public Library in Middlebury on May 1 at 7:00 pm. 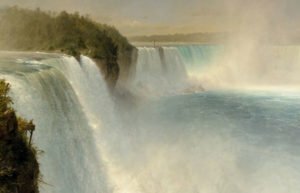 Her talk, “Natural Icons and National Identity: Frederic Church’s Landscapes,” is part of the Vermont Humanities Council’s First Wednesdays lecture series and is free and open to the public. Frederic Church painted landscapes of distinctive American features, including Natural Bridge in Virginia and Niagara Falls in New York. Eleanor Jones Harvey’s talk will explore how and why we used these American landscapes to distinguish the scale and scope of our cultural ambitions. The Vermont Humanities Council’s First Wednesdays series is held on the first Wednesday of every month from October through May in nine communities statewide, featuring speakers of national and regional renown. Talks in Middlebury are held at Ilsley Public Library unless otherwise noted. All First Wednesdays talks are free and open to the public. See the full schedule of Middlebury First Wednesdays talks. The First Wednesdays 2018-2019 series in Middlebury is underwritten by The Residence at Otter Creek. “Natural Icons and National Identity” is underwritten by A Friend of the Series. Ilsley Public Library is sponsored by Friends of the Ilsley Library.